This tea is the result of carefully crafted blending, to ensure that the essential harmony of the botanicals healthful properties yield a superb tea experience. Our artisan crafted blend of top of class Fair Trade, organic black teas will cheerfully awaken and delight you with its rich, smooth flavor and sumptuous floral aroma. Grown by small, socially-just gardens, this highest grade exotic blend of Indian, Ceylon and China whole leaf teas brew a full-bodied, stimulating cup. Its distinct, deep flavor is enhanced with a splash of milk. Ingredients: A Blend of Black Teas: Yunnan, Nilgiri and Ceylon. 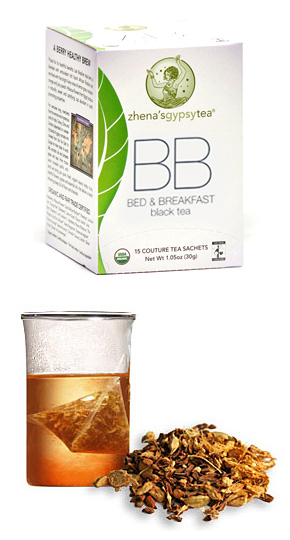 When it comes to breakfast blends, I want the tea to be strong – something that will help me shake off that “still sleepy” feeling that I have in the morning. This tea does that, but still offers an agreeable sweet taste that brings a smile to my face. It is a pleasantly robust, bright-tasting blend of black teas. I find it very well-rounded: smooth, but not too silky; vigorous, but not too strong; sweet, but not sickeningly so. Just a very flavorful black tea. It’s a little milder than some breakfast teas – it doesn’t reach out and slap you in the face to wake you up. Instead, it gives you a sweet, gentle nudge to get you going. The tea finishes with a dry note to the palate, much like drinking a fine dry wine, but without the bitterness I’d associate with that wine. I like this tea very much, and I like it even better knowing it is a blend of organic, fair trade teas. This is one that you can feel good about waking up to in the morning!